MIDLOTHIAN, Va. — Rep. Dave Brat faced a rancorous crowd at a town hall here Tuesday night that took issue with his positions on health care, Russia investigations and, frankly, most other topics. Brat, meanwhile, took issue with many of the attendees’ frequent shouting over him, saying it was counterproductive to civil discourse. “The people that are yelling are not helping to get to solutions,” the Virginia Republican said. Contention defined the hour-and-a-half town hall, which was co-hosted by Brat and Virginia state Sen. Amanda Chase. Health care was the hot topic, but questions touched on a wide array of issues from the federal budget process to President Donald Trump’s tax returns to environmental and internet policies. A vocal and relatively large group of the few hundred attendees almost constantly objected to Brat’s answers, seemingly because their own policy and political views were not aligned with his. Indeed, the majority of the crowd admitted to having voted for Democratic presidential candidate Hillary Clinton and to supporting keeping the 2010 health care law, according to a survey in which attendees were asked to raise their hand to show support for a particular position. Less than one-third of the crowd admitted to voting for Republican President Donald Trump and even fewer said they supported repealing and replacing the health care law, according to the same survey. Brat, a board member of the conservative House Freedom Caucus, is a Trump supporter and vehement opponent of the health care law. Protesters lined up across the street from the event held signs that mostly signaled frustration with the health care bill. 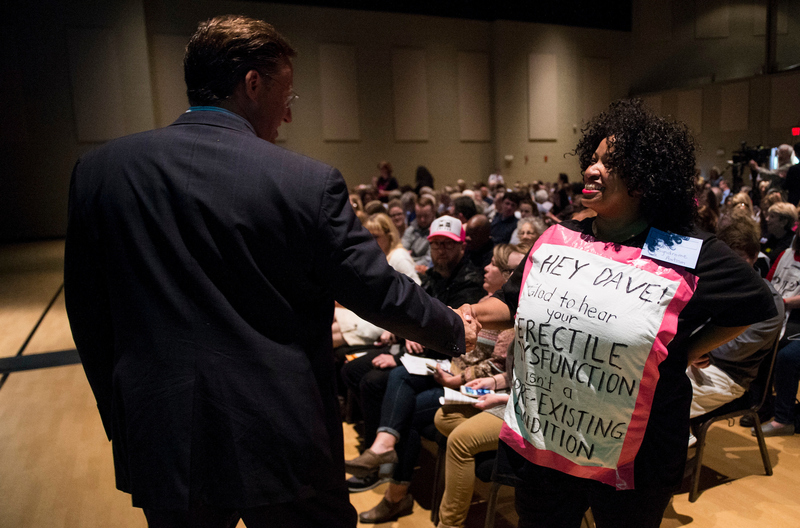 While Brat took a lot of heat for his support of the health care bill at the town hall Tuesday, it’s unclear if there would have been less criticism if he had held onto his opposition. For example, Kirsten O’Nell, a Democrat from Glen Allen, Virginia, said Republicans should have tried to improve the current health care law, rather than repeal it. “They just made it a lot more expensive,” she said of the House bill. Brat sought to tamp down resistance to the legislation with opening remarks about how the bill maintains protections for people with pre-existing conditions, reading language from one of the amendments adopted before last week’s vote that specifically said nothing in the bill should be construed otherwise. “If you want to debate other issues, that’s good, but on the pre-existing [conditions], I think all the bases are covered and I just covered it in detail,” Brat said after his explanation. Still, it was among one of the first questions to come up as the moderator sifted through cards of questions submitted by the attendees. By the end of the event, the moderator went through 61 of the cards submitted, according to a Brat aide. When asked why is it not important for citizens to see Trump’s tax returns, a question that drew a standing ovation, Brat said he disagreed with the premise of the question. Brat “half lied” when he said that, Catherine Anderson of Henrico, Virginia, said in an interview after the town hall, pointing out that Republicans voted to block Democrats’ efforts to bring that issue up for a vote. Anderson said she was not impressed by Brat’s answers, noting it was odd that he often referred to Trump and Sens. Bernie Sanders, I-Vt., and Elizabeth Warren, D-Mass., in the same sentence when trying to make a point about draining the swamp in Washington. “The parallels he was trying to draw there were false,” she said. Anderson said she voted for Brat in his 2014 primary where he defeated then-House Majority Leader Eric Cantor, saying she was one of many Democrats who did so because they wanted to push Cantor out of office. She said she could see something similar happening to Brat in the near future. In a sign that many in the crowd didn’t buy what Brat was selling, the congressman even drew some boos during his answer to a question about the budget process. Brat said he disagrees with Congress frequently passing continuing resolutions to extend current funding rather than adhering to the normal appropriations process. “I don’t like it. We should be doing real budgets,” he said. While the town hall focused on a wide array of topics, the issue of the day in Washington was the firing of FBI Director James B. Comey. Brat was asked whether he would advocate for a special prosecutor for the Russia investigation given Comey’s firing, a question that drew loud applause from the crowd. Despite the majority of the crowd disagreeing with Brat throughout the event, he did have some supporters in the audience. “Everything that Dave ran on — every promise he’s made, he’s kept,” Bill Heipp of Midlothian said. Heipp, a Republican, said he’s been supportive of Brat since his effort to oust Cantor. He did not have an issue with Brat supporting the health care bill or any other objections raised at the town hall other than a general concern about the state of politics in Washington. Kyi Foster, an independent from Chesterfield, said he came to the town hall mostly to listen. His primary issue of concern as a citizen is the poor condition of the local school district, but noted his position is that the federal government should not be involved, a view Brat shares. Foster said he was not a big fan of the 2010 health care law, nor is he an emphatic supporter of the GOP’s replacement plan. He said the latest changes to allow states to opt out of certain mandates, like the one that makes him have to pay for maternity coverage as part of his insurance plan that only covers him and his two sons, was an improvement. “I don’t know if there’s a right or wrong way for a Republican to go right now,” he said of the health care bill. Foster was also among the constituents present who voted for Brat over Cantor. “Eric Cantor was part of the establishment and part of the problem,” he said.